The water is blue, cold and clear, as pristine as the freshly fallen snow from which it once melted. In places, the depth is over 1000 feet, and looking over the edge of the small tourist boat on which you are traveling, you could swear that you can see all the way to the bottom, though you understand that you cannot, but something is moving down there, something, and you believe that you can see it. You mention it to your wife, who just shakes her head and smiles. You do not mention it to anyone else, because you don't want to be laughed at and potentially sent to a psychiatric ward when the boat returns to dry land. But the image will not depart. Something was moving down there. 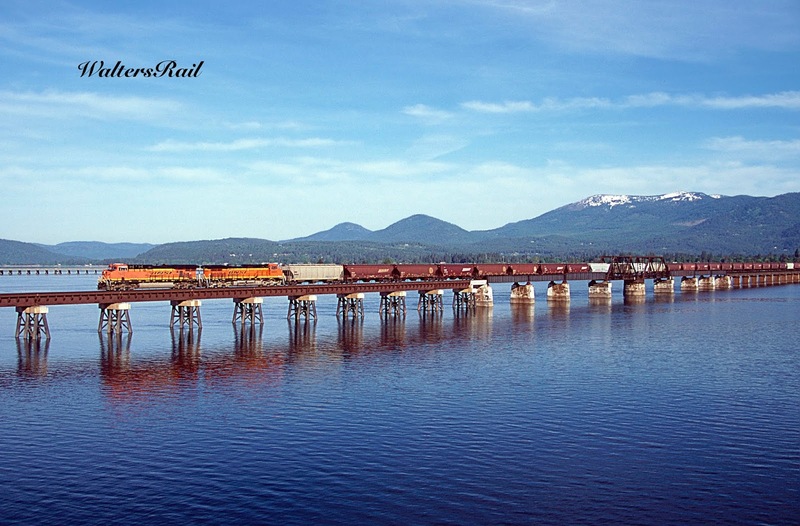 BNSF stacks, with CSX power, are rolling southeast (railroad west) across Lake Pend Oreille in northern Idaho, with the Cabinet Mountains in the background. 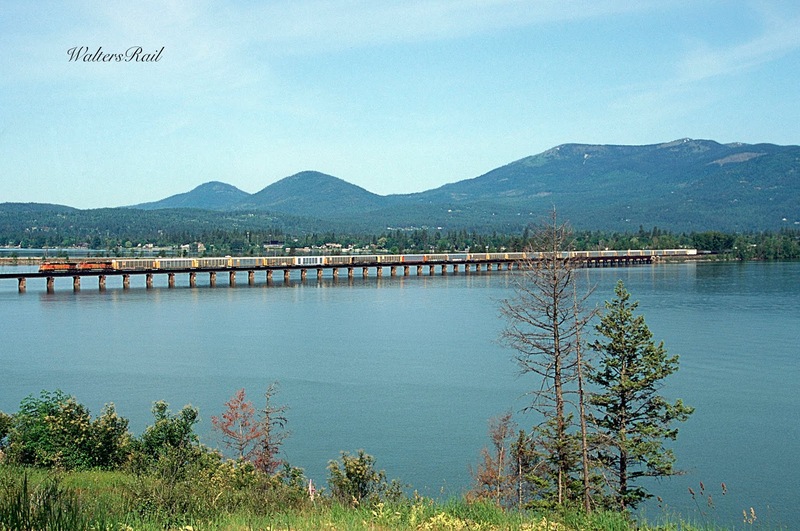 Lake Pend Oreille (pronounced "ponderay") is one of the most beautiful spots in the beautiful Pacific Northwest. 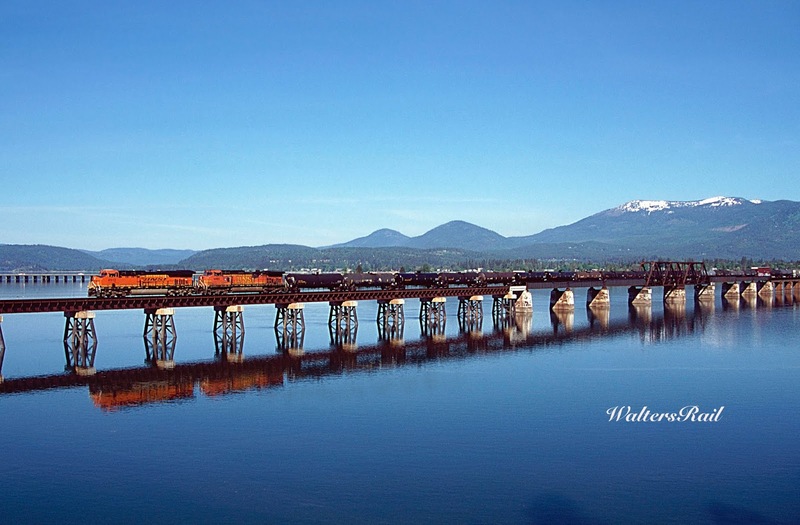 Since I love to watch trains, it has the added bonus of containing a lengthy, open-span, railroad bridge that carries all traffic on the former Great Northern and Northern Pacific lines (now BNSF and Montana Rail Link) in what is called the "funnel" -- the single point where the two major northern transcontinental railroads came together in northern Idaho, thereby avoiding the rugged crossing of the Bitterroots that brought so much grief to the Milwaukee Road's Pacific Extension. In this post, I want to show the beauty of the bridge and the surrounding landscape and also, perhaps, provide an answer to the question of what I thought I saw at the bottom of the lake. 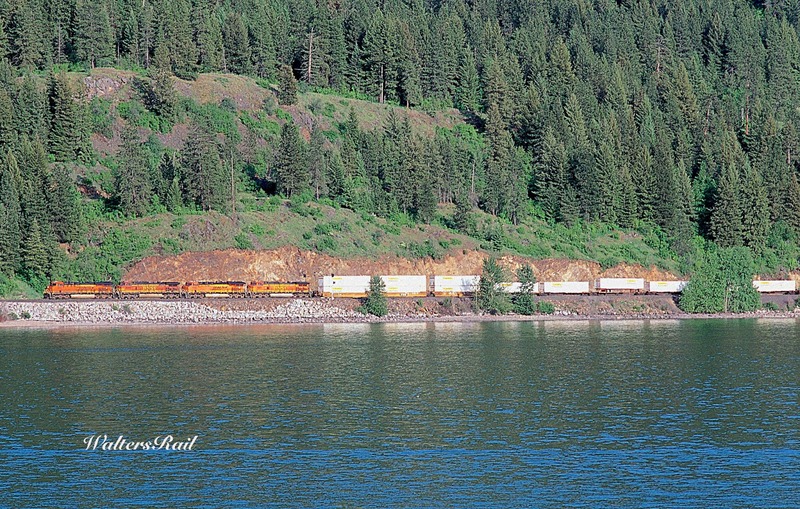 Eastbound Z-Train beginning the long crossing of Lake Pend Oreille. 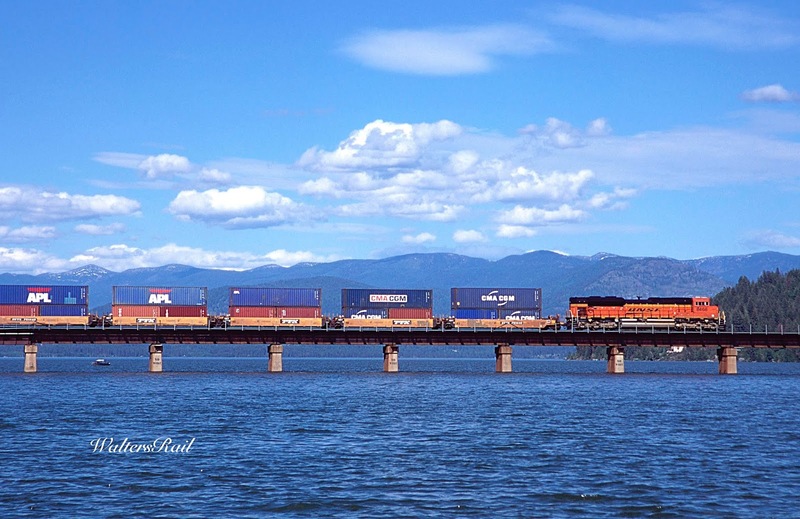 On an early June morning in 2014, a westbound mixed freight is crossing Lake Pend Oreille. The Selkirk Mountains rise in the background. Lake Pend Oreille is the remnant of a gigantic lake of biblical proportions that flooded the Pacific Northwest repeatedly 15,000 to 20,000 years ago, forever changing the face of that country. Today, it is the largest lake in Idaho and the 38th largest in the United States, with a surface of 148 square miles. 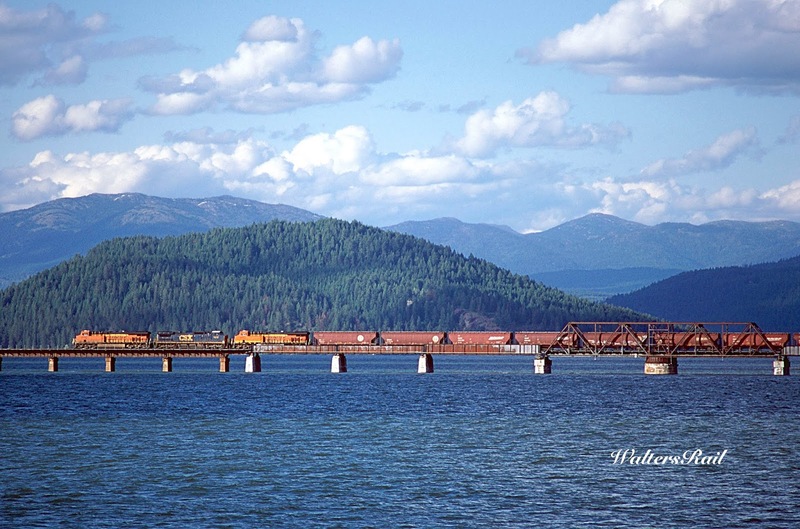 Forty-three miles long and 1,150 feet deep in some regions, Lake Pend Oreille is the fifth-deepest in the nation, is fed by the Clark Fork and Pack Rivers and drains through the Pend Oreille River. Like its more famous cousin in California, Lake Tahoe, this remote lake in northern Idaho has rivers flowing both into and out of it but never runs low of water because of the deep trench carved thousands of years ago by ancient glaciers. During the Second World War, the south end of the Lake was a naval training ground and the largest settlement in the state. Built because of the Pearl Harbor attack, the training station is now a state park. Lake Pend Oreille's Large Scale Vehicle Range is still used by the Navy's Acoustic Research Detachment for sonar testing with submarine prototypes. The significant depth of the lake gives acoustic properties similar to the open ocean. A westbound oil train enters the Funnel. 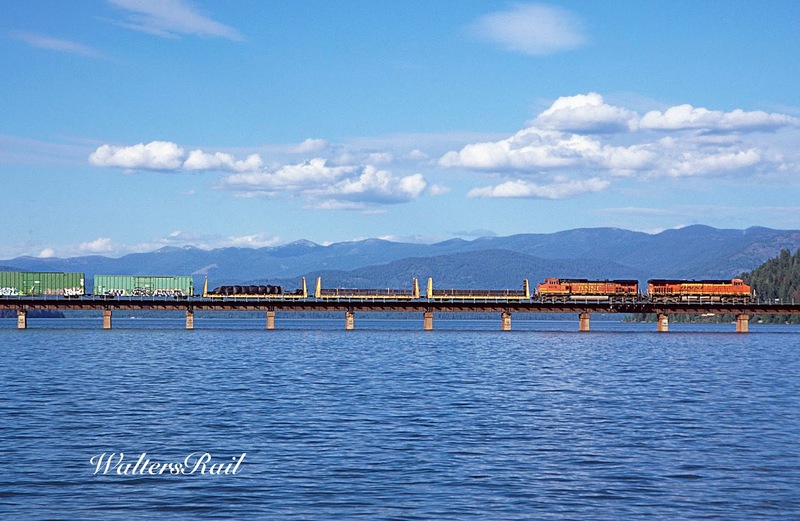 Eastbound grain (compass northwest) rolls slowly across the brilliant blue waters of Lake Pend Oreille -- June 2018. "Pend Oreille" is a French phrase meaning "ear drop" or "ear pendant" and, as nearly as I can tell, was the name given by French traders to the Kalispel, a Native American tribe of the Pacific Northwest who wore large earrings made from shells. "Kalispel," a native word, translates to "Camas People" and refers to the camas plant, which the natives ground for flour. I believe that both names are used today for the tribe, which in the 18th century had an estimated population of about 1,600 and lived around the lake and river now bearing their name. The area settled by the Kalispel was made habitable after the conclusion of the most recent ice age, when massive glaciers receded, including the ice dams that had created the ancient and gigantic Lake Missoula, exposing habitable ground that had been covered by ice and water for thousands of centuries. The Purcell Trench, running north/south from southern British Columbia into the Idaho panhandle, bracketed by the Selkirk Mountains to the west and the Cabinet Mountains to the east, provided a trough for what is called the Purcell Ice Lobe to advance south from the Canadian Ice Sheet to Green Monarch Ridge, which runs east to west and rises like a huge rock fence across what is now the south-central edge of Lake Pend Oreille, stout enough to deflect the ice southeast down the Clark Fork Valley and southwest toward Rathdum Prairie. Between 15,000 and 20,000 years ago, this mass of glacial ice created dams that backed water up the Clark Fork River over 200 miles into Montana, forming Glacial Lake Missoula that was estimated to have been over 2000 feet deep at the ice dams, which failed repeatedly, releasing unbelievable floods westward that scoured the land all the way to the Pacific. 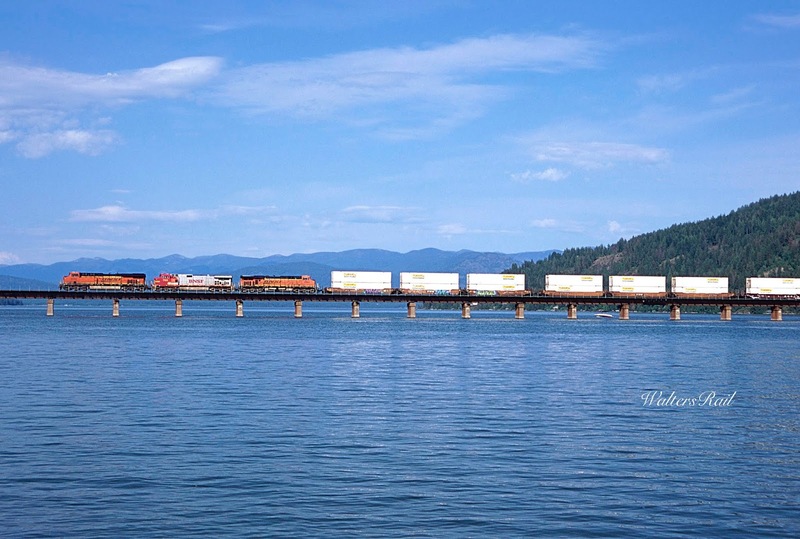 Eastbound stacks roll across Lake Pend Oreille. 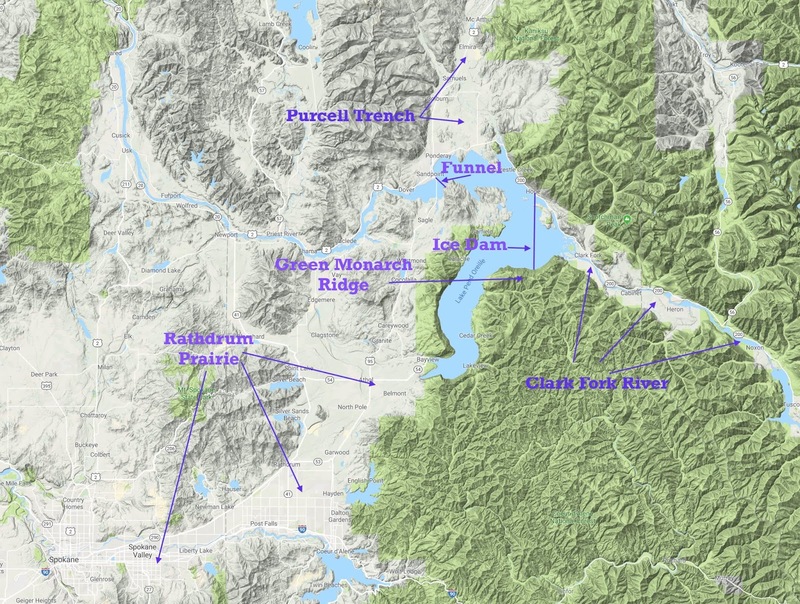 The path of the Missoula floods varied, depending on how far south the glacial ice had advanced. Most of the flood waters flowed southwest following the present day route of U.S. 95 through the Rathdrum Prairie. When the ice had not advanced quite so far south, the floodwaters escaped northwestward, following the course of present U.S. Highway 2. In all these mega-floods, the cataclysmic waters gouged trenches across the land as far as the mouth of the Columbia River at the entrance to the Pacific Ocean. 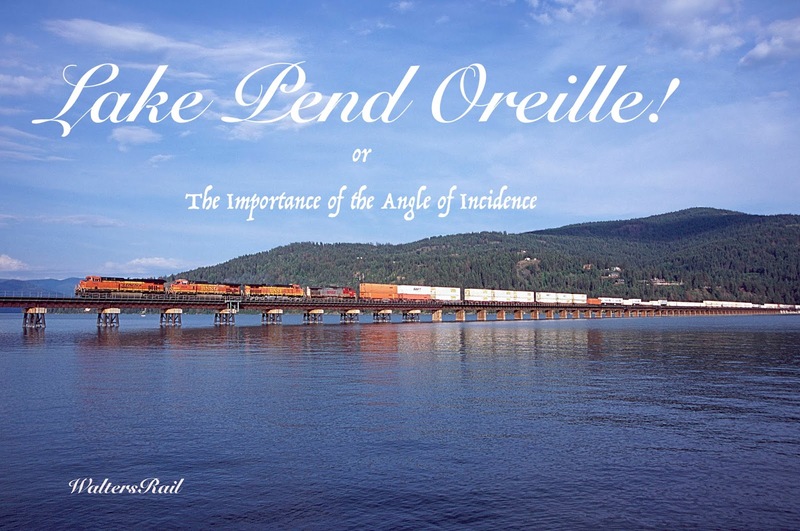 Because of Lake Pend Oreille's extreme depth, the lower reaches of the lake, where I believe I saw something that day on the tourist boat, are extremely difficult to study. In the 1990's, the U.S. Navy conducted seismic reflection surveys demonstrating that the basin's bedrock bottom had been gouged more than 500 feet below current sea level by erosion during the last Ice Age. The bottom 1,500 feet of the trench were later filled with glacial and mega-flood sediment, without which the lake today would be almost 3,000 feet deep! 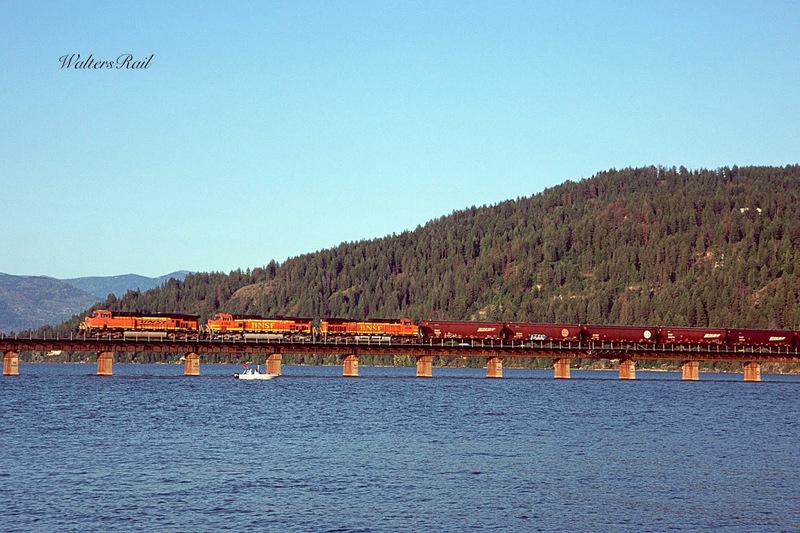 Westbound (compass southeast) BNSF stacks have just rolled across Lake Pend Oreille and are headed to Spokane, Washington, down the Rathdrum Prairie. The Purcell Trench that provided the route for the Purcell Ice Lobe follows a fault that pre-dates that last Ice Age by millions of years. During the last Ice Age, the trench was scoured repeatedly by glaciers flowing south. For thousands of years, ice advanced and retreated in the trench, carrying granite boulders with it, grinding and scouring the landscape beneath, leaving a broad, u-shaped valley behind. The ice was so deep that only mountains above 4,500 feet would have been visible above the glacier. 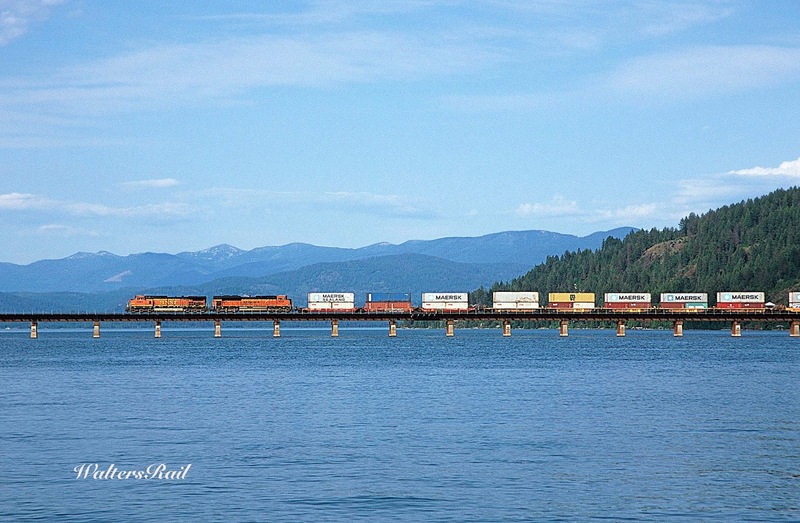 Eastbound (compass northwest) BNSF stacks have just come across Lake Pend Oreille and are headed toward Bonner's Springs, Idaho. 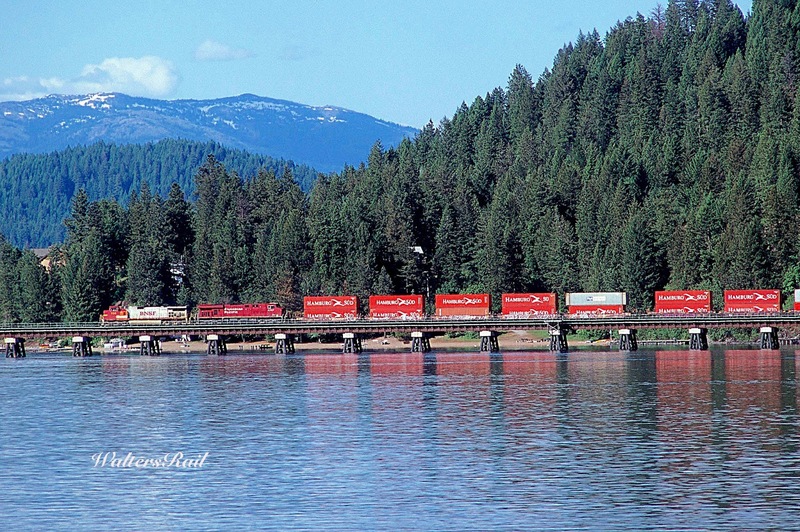 Pushers on a westbound oil train (compass southeast) are crossing Lake Pend Oreille. Now you are probably wondering about my claim that I could see something deep beneath the surface of this beautiful lake. So I will set out to prove my claim. First comes a short discussion of Snell's law. When we see something beneath the surface of water, some light we see is reflected off the surface, while some is refracted from below. Light coming from beneath the surface travels more slowly and is bent slightly (refracted) as it crosses the boundary. The amount of refracted light depends on the angle at which the rays strike the surface -- the "angle of incidence." When the angle is small, the light is traveling almost straight up, and almost all of it passes into the air. The following formula, part of Snell's law, holds that 1 sin r = 1.33 sin i, where 1.33 is the refractive index of water, 1 is the approximate refractive index of air, "i" is the angle of incidence and "r" is the angle of refraction. Solving this formula for various values of "i" demonstrates that when the angle of incidence reaches slightly less than 49 degrees, the angle of refraction reaches 90 degrees, which means that light from below the surface does not pass above the water. A simple way to think of this is that you can only see objects beneath the surface of water if you are looking at them from an angle of about 45 degrees or less (when looking straight down is zero degrees). When I was peering off the edge of the tourist boat, I was looking almost straight down, so for anything down there, the angle of incidence would have been tiny, and the light waves would have passed through the surface of the water. I am stopping my proof here, because I want to discuss more of the geology surrounding Lake Pend Oreille. I will return to the discussion of what I saw in the lake in due course. Westbound fuselages are headed to Boeing in Washington. In the mid-1880's, northern Idaho had more trails than roads. Travel was measured in days; reports from the outside world traveled by horse. The arrival of the railroad was as monumental as the invention of the printing press and revolutionized the world in much the same fashion. 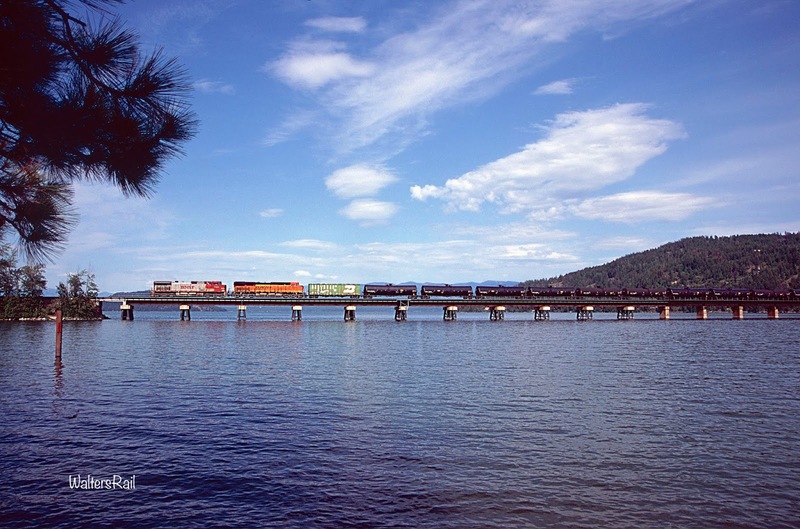 And because of geologic happenstance, Lake Pend Oreille became the focal point of the transcontinental railroads. The above image shows the mountain barrier separating the Great Plains from Spokane and eastern Washington. There is no route west that does not cross the Continental Divide on a high mountain pass. And at first glance, it appears that any railroad line through this territory would cross one mountain pass after another. But look again. 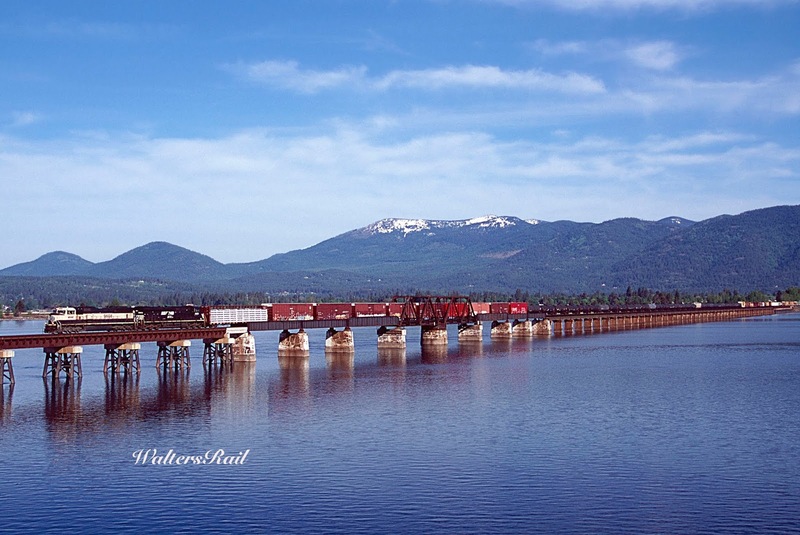 Lake Pend Oreille opens to the southwest onto the Rathdum Prairie, a narrow passageway between peaks, relatively flat with no significant grades, leading to Spokane. That is why the Northern Pacific runs from Missoula hard northwest up the valley of the Clark Fork River -- to avoid crossing the Bitterroot Mountains that lie directly west and form the border with Idaho. 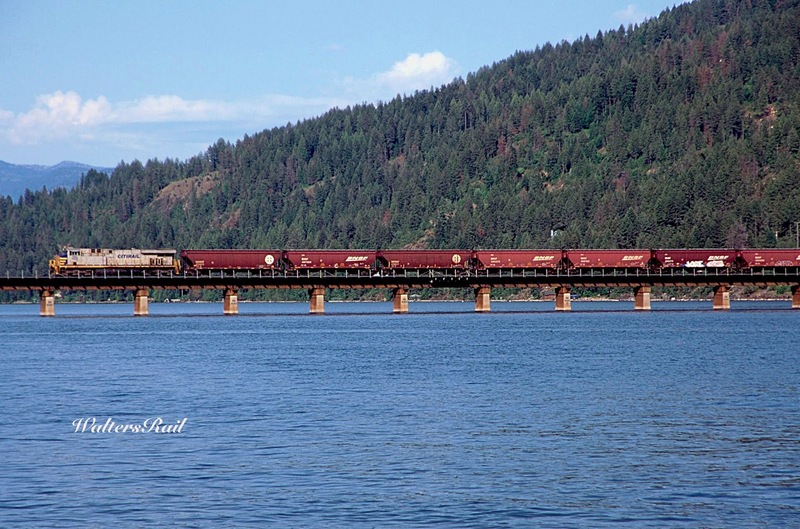 When the Great Northern Railway came through northern Montana ten years after the Northern Pacific, it too chose a route through a river valley (the Kootenai) that led to the shores of Lake Pend Oreille. 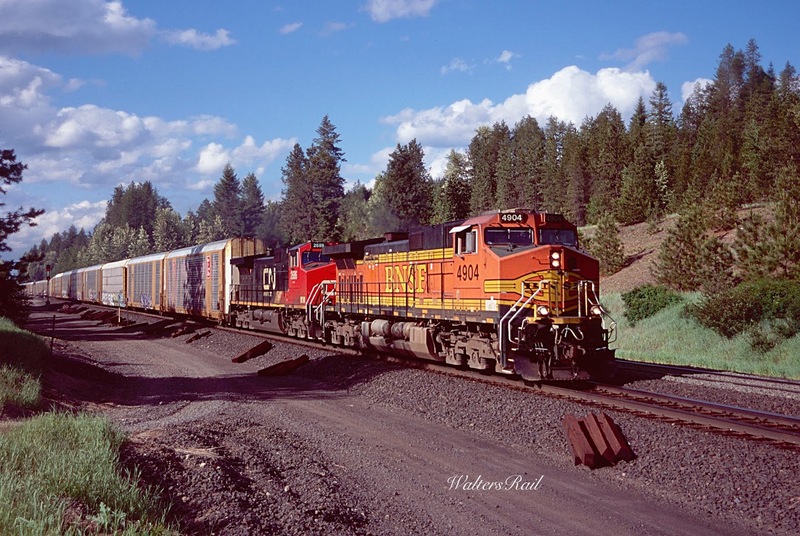 So both of these northern transcontinental railroads converged on the same location, because it allowed them to emerge into eastern Washington without crossing another mountain pass. 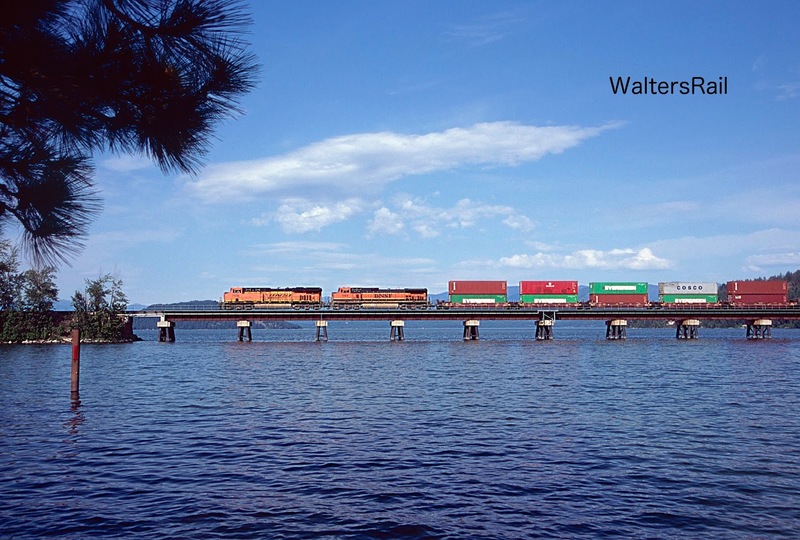 The Milwaukee Road's Pacific Extension was not so fortunate. From Missoula it followed the Clark Fork (paralleling the Northern Pacific) as far as St. Regis, where the river makes a double horseshoe before heading northwest again. 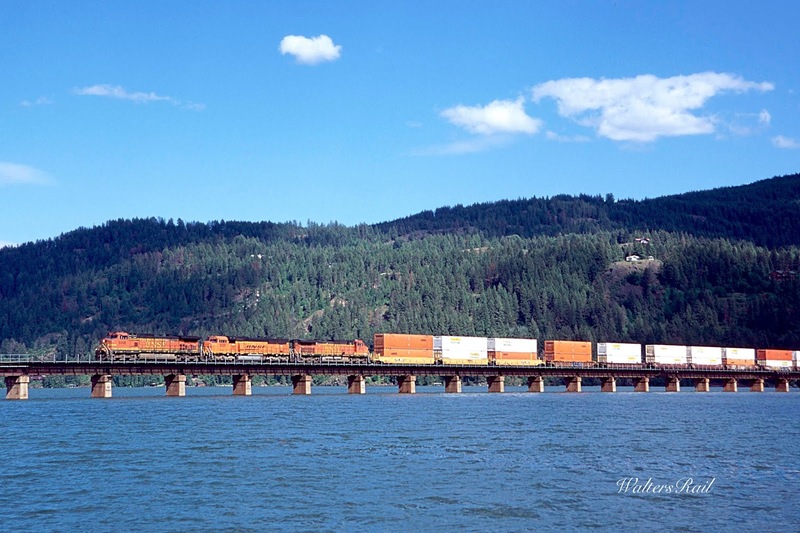 The Milwaukee Road made a due west turn and followed the St. Regis River up the side of the Bitterroot Mountains to St. Paul Pass, a torturous route that both the Northern Pacific and Great Northern had gone out of their way (by hundreds of miles) to avoid. 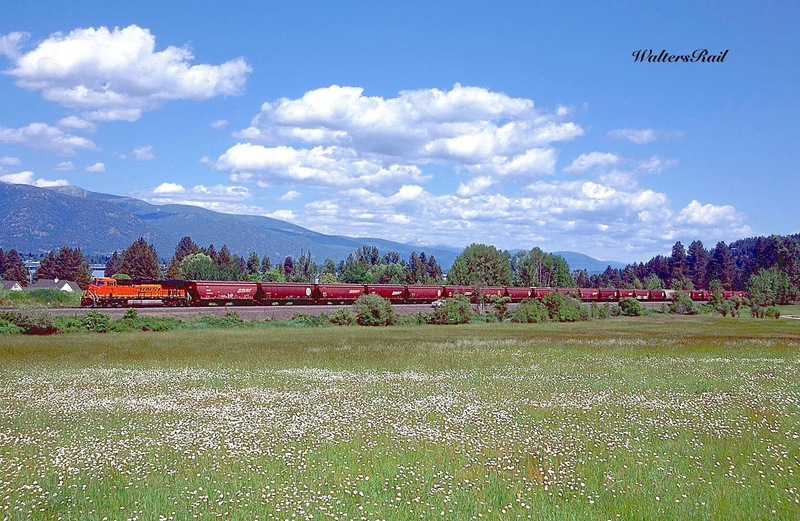 Westbound autos roll toward Athol on their way to the Rathdrum Prairie. To understand what created the Rathdrum Prairie, we must look at four separate geologic events, starting with the Belt Supergroup Rocks, thick sediments of clay, silt and sand deposited in a basin along the edge of an ancient sea running south through what is now the Idaho Panhandle. The basin was formed by underground forces pulling rocks apart, filling originally with water, followed by sediment washing from the land. As the rift filled, it continued to sink, allowing the deposit of even more sediment tens of thousands of feet deep. Eventually, the combined weight metamorphosed the sediment into a rock called argillite. Next came the Kaniksu Batholith, a huge mass of granite pushed upward 70 to 80 millions years ago when two tectonic plates collided near what is now the western border of the Idaho Panhandle. When the granite intruded, the overlying Belt Supergroup Rocks were pushed to the east along the Purcell Fault, forming a trench that, over millions of years, filled with gravel and sand, forming the ancestor of the Rathdrum Prairie. These events were followed by the Columbia River Basalt Floods, a series of gigantic volcanic eruptions (perhaps as many as 250) that occurred 12-17 million years ago along the Columbia River near the current Idaho, Oregon and Washington borders, covering an area of about 63,000 square miles with approximately 42,000 cubic miles of basalt. In places today in central Washington, this basalt is over 6,000 feet deep -- more than a mile! In other words, once the eruptions had subsided, the surface of the earth was covered by lava more than one mile deep. After the Kaniksu Batholith came the Biblical Lake Missoula floods described above. Glacial floods of such magnitude are called "jokulhalups," an Icelandic term meaning "glacial run." The water in the Rathdrum Prairie may have reached depths of 450 feet and flowed with velocities of 50 to 100 miles per hours. Flow rates may have reached one billion cubic feet per second -- more than the current flow of all the world's rivers combined. It takes little imagination to understand how such gargantuan water flows could flatten the land between mountain peaks. For many years, geologists struggled to answer the question: Where did all the water come from? It was obvious that gigantic amounts of water had washed across the Rathdrum Prairie, but no one knew where the water originated. In the early 1900's, scientists discovered a series of parallel lines in the hills surrounding Missoula, Montana, indicating the shoreline of an ancient lake. The lines extend up the Clark Fork River into Idaho, then end abruptly at what came to be understood as the ice dam that created the gigantic lake. The lines tell us that the ancient lake emptied and refilled many times, always at a lower level than before; otherwise, the previous shoreline would have been destroyed. Instead, there are a series of lines, one on top of the other, like the rings in a tree. The succeeding lower levels of Lake Missoula likely indicate that, because of the warming climate at the end of the last Ice Age, each ice dam was failing sooner than previous iterations. The first geologists to advance the theory of cataclysmic floods in the Pacific Northwest was J. Harlen Bretz of the University of Chicago, who in 1923 published the first paper discussing evidence for the floods. His colleagues scoffed at the notion that geological changes could occur due to catastrophic events, because the generally accepting thinking of the time held that the earth's geology changed slowly over millions of years. But Bretsz refused to change his position, despite vituperative ridicule from many of his colleagues. "Ideas with precedent are generally looked upon with disfavor," Bretz said, "and men are shocked if their conceptions of an orderly world are challenged." Bretz's theory of catastrophic floods was not generally accepted until the 1960's. More eastbound grain above a pleasure boat. 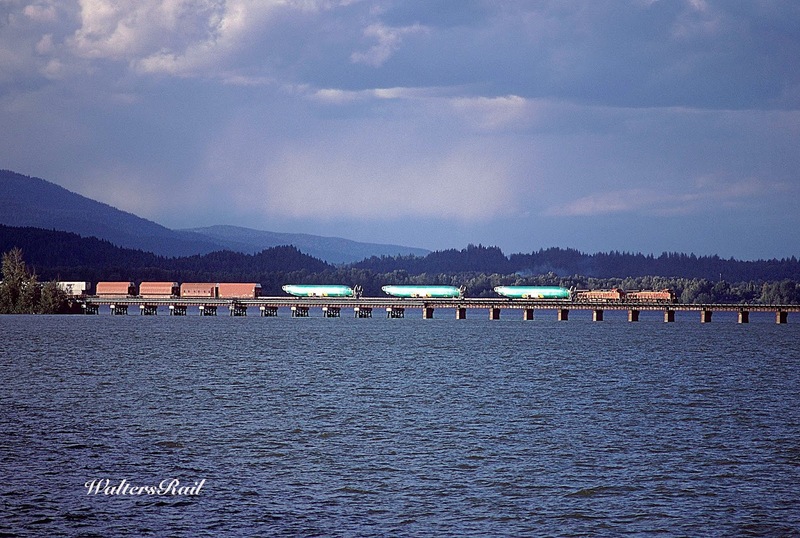 A pusher and eastbound stacks roll above another pleasure boat on Lake Pend Oreille. Westbound grain crosses the lake beneath a magnificent home that was for sale when the image was taken. Thinking that I could be comfortable drinking beer on one of dwelling's several decks, I called the number shown on the real estate company's sign in the front yard. The listing price of the house in June 2018 was $1,750,000.00. So I guess I won't retire to northern Idaho. 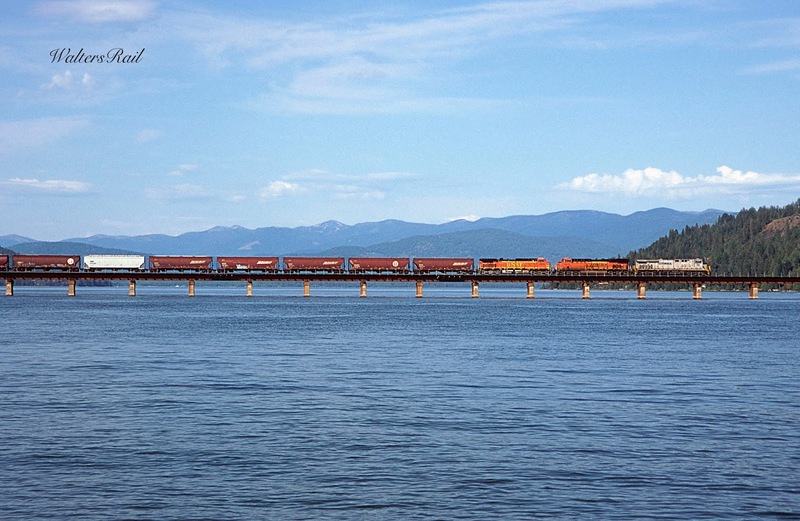 Lake Pend Oreille is bracketed by the Selkirk Mountains (on the west) and the Cabinet Mountains (on the east). The Selkirks span the northern Idaho panhandle, eastern Washington and southeastern British Columbia and define the western edge of the Purcell Trench. They are one of several ranges in the Pacific Northwest distinct from, and significantly older than, the Rocky Mountains to the east. The Kaniksu Batholith, discussed above, underlies most of these mountains. 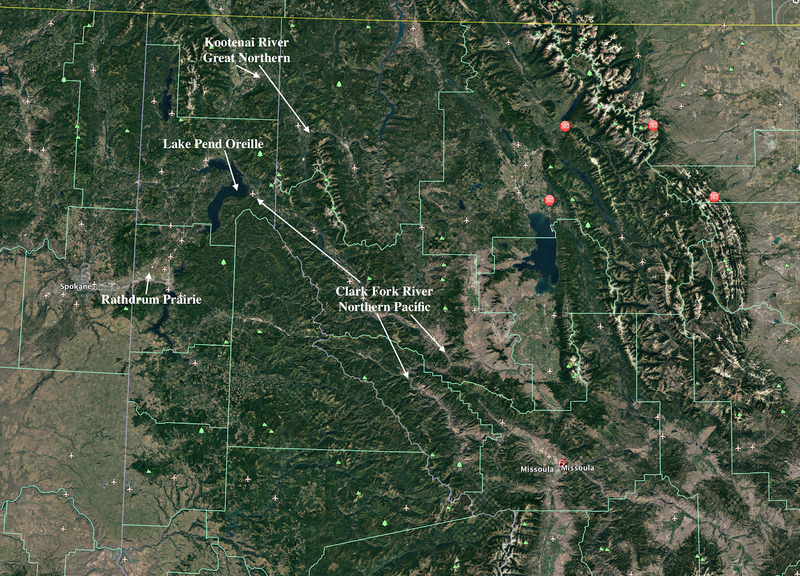 The Cabinet Mountains straddle the Idaho-Montana border where they define the eastern boundary of the Purcell Trench from the Kootenai River south to Lake Pend Oreille and the Clark Fork River. These mountains are composed of the Belt Supergroup Rocks, which as discussed above were pushed to the east by the Kaniksu Batholith, where they piled up to form the Cabinet Mountains. The peaks and valleys that we see today were carved millions of years later by glaciers. 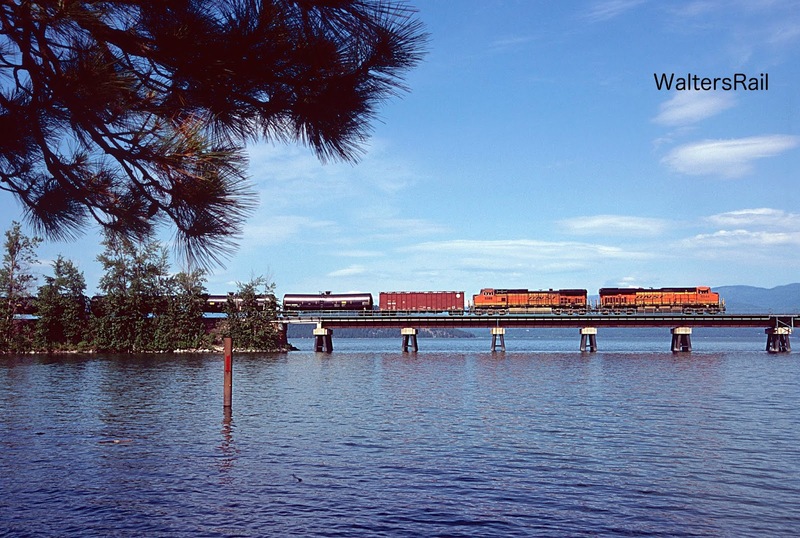 A Union Pacific stray is crossing the lake. 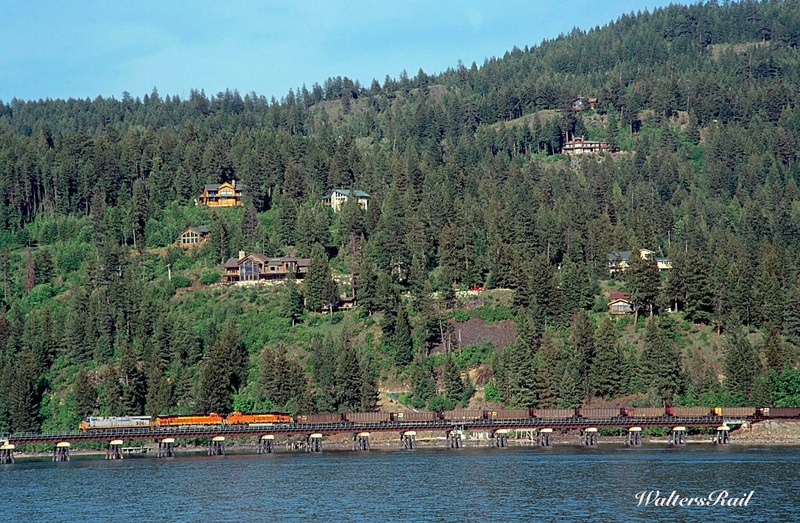 From high above the water, we see westbound autos crossing Lake Pend Oreille, with Sandpoint, Idaho in the background. 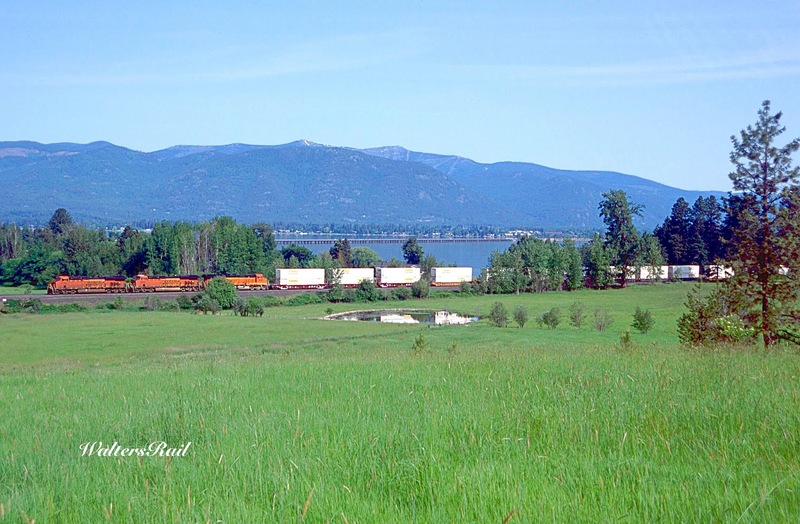 An eastbound grain train begins to roll across Lake Pend Oreille. The million dollar-plus home is in the center of the image. If you look close, you will see that I am not drinking beer on the deck. So I want to return to the question what, if anything, did I see in the depths of Lake Pend Oreille. The intense blue color of the lake will help answer this question. The water in Lake Pend Oreille is so blue because, in part, it reflects the sky. Thus, the water looks bluer on a clear than a cloudy day. But there's more than that. Clear water absorbs red light, thereby emphasizing the reflected blue. The clearer the water, the brighter the blue. And the water in Lake Pend Oreille is very clear. Sources I have consulted indicate that on a sunny day, in water this clear, it is possible to see from 100-150 feet below the surface. 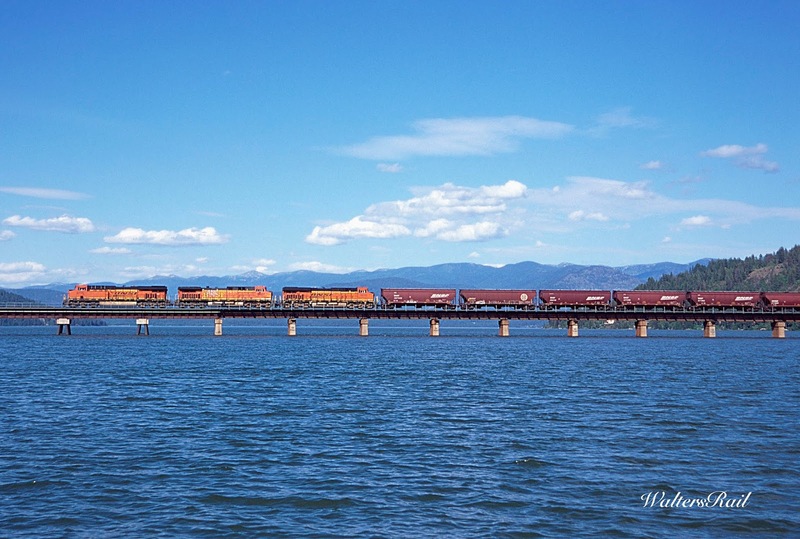 A Citirail unit is pushing west coal across Lake Pend Oreille. 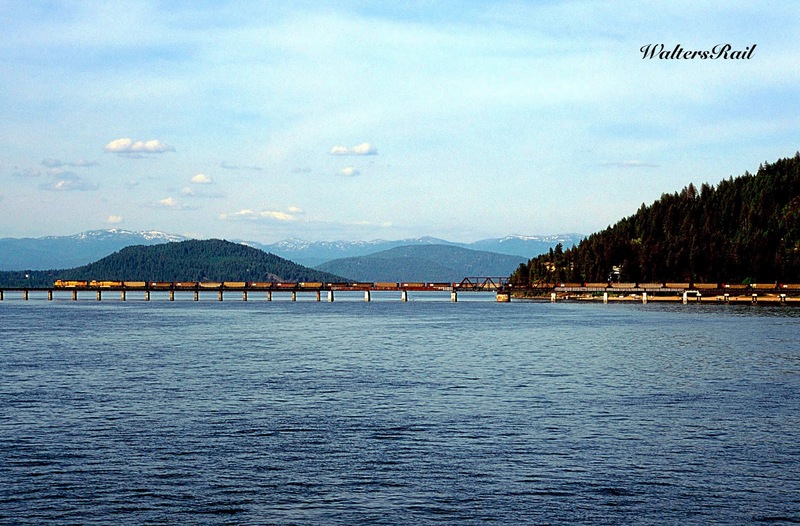 Supposedly, Lake Pend Oreille is home to a creature over 20 feet long that undulates up and down as it swims. Called the "Lake Pend Oreille Paddler" by journalists, the creature was first sighted in the 1940's, when the U.S. Navy was testing submarines in the lake. In 1977, a young girl was attacked on a beach by a creature which she claimed had come up out of the lake. In 1984, the year of my son's birth, James R. McCleod, a professor from North Idaho College, interviewed several hundred people who had lived along the lake and concluded that the creature was most likely a giant sturgeon. 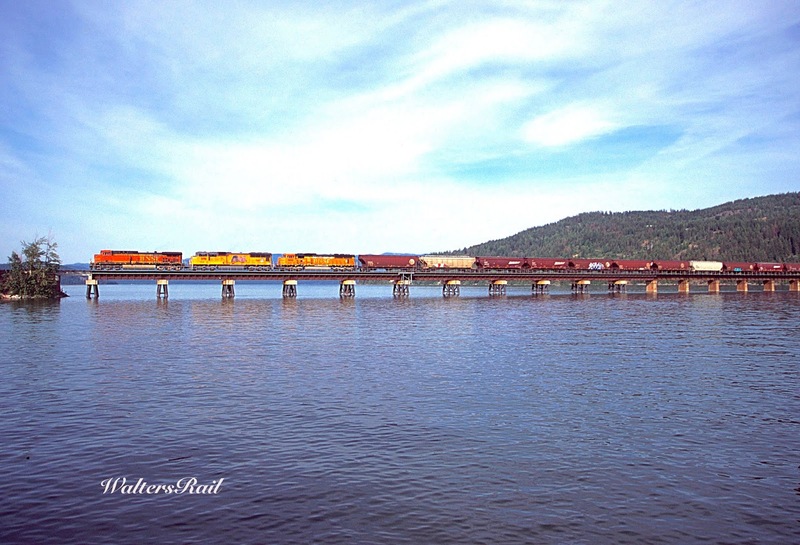 In the early morning, a loaded, westbound grainer crosses the calm waters of Lake Pend Oreille. This image was taken from a location that, due to road construction, is no longer available. I have found several pictures of sturgeon over 12 feet long and weighing over 500 pounds. Sturgeon are bottom-feeders that scrape river beds and lake bottoms with their snouts that make them look somewhat prehistoric. I've read that some sturgeon weigh over 1000 pounds. They often live 60 years or longer, and it was once common in Canada and the United States to find fish over 100 years old. But overfishing has greatly thinned the ranks, and many species of this fish of are now protected in North America. The largest sturgeon ever caught was a female found in the estuary of the Volga River, weighing almost 3,500 pounds and stretching over 24 feet long. Sturgeon have been reported to leap out of the water, making an extremely loud splash that can be heard a half-mile away or more, and probably farther underwater. If I had seen a 600 pound fish leap out of the water, I would have thought I had seen a monster. If I had seen it alone, I would not have told a soul for fear of being institutionalized. No one knows why sturgeons jump out of the water. My guess is that they do it because they can. Eastbound stacks are crossing the lake in late afternoon, as wind roils the blue water. So did I see a sturgeon from the bow of the small tourist boat on which my wife and I were touring Lake Pend Oreille? To answer that question, I must provide background. When John Milton wrote his famous sonnet "When I Consider How my Light is Spent," he was criticized for delving into the personal, which until the late 19th century was not considered a proper subject for serious literature. Here is the sonnet. To understand, it helps to know that Milton went blind in middle age and dictated his most famous poetry to his several wives. It also helps to know that the English word "patience" derives from the Latin "patiens," which means the ability to endure great suffering. Thus, the phrase the "patience of Job." To answer the question, I must also delve into the personal. I am not comparing myself to John Milton. I am just trying to provide context. 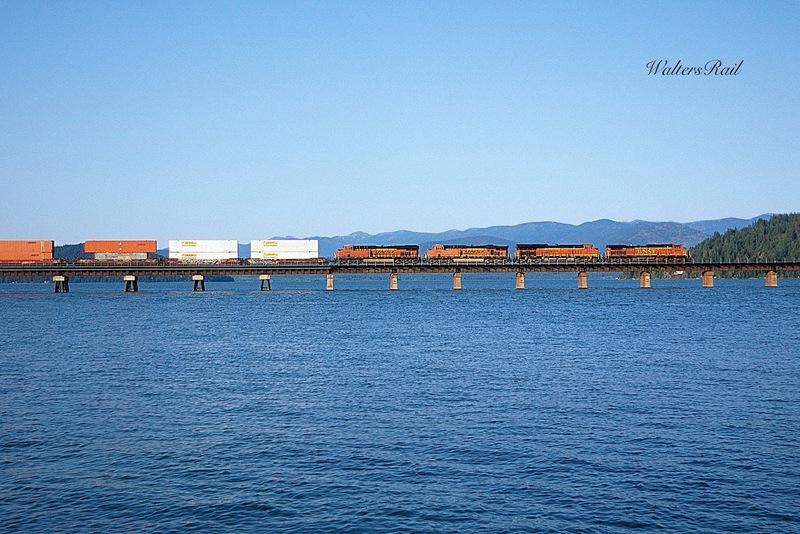 Eastbound stacks are running along the shore of Lake Pend Oreille, preparing to cross the bridge. I have not gone blind. Nor, unlike Milton, have I been involved with a philosophical war with the Church of England. But I do have my own issues. To be specific, I sometimes suffer from the "black dog" that Winston Churchill so famously wrote about. Churchill picked up the phrase from his childhood nurse. During those times, "black dog" was commonly used by Victorian nannies to describe out-of-sorts children. Churchill used the phrase to describe periods of anxiety and depression. According to his last private secretary, Sir Anthony Montague Browne, Churchill might say, "Let's go and find the sunshine." This often preceded a trip to the south of France, where the sun would alleviate Churchill's dark mood. There he could engage in oil painting, a pastime that insulated him from his troubles. Churchill himself admitted that painting was a certain cure to his tendency to dwell on the negative. 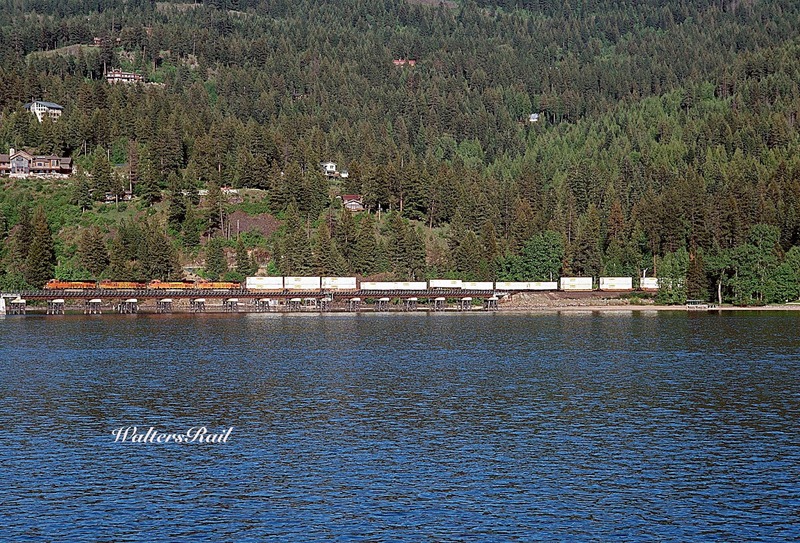 A westbound manifest is crossing Lake Pend Oreille. 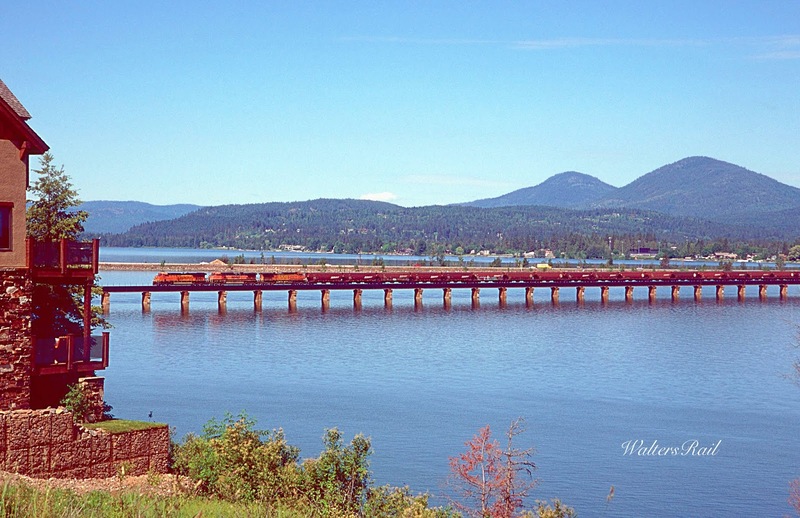 An international War Bonnet passes one of Lake Pend Oreille's many beaches. Churchill must have been exceedingly difficult to live with. I recently read a biography of his wife that indicates he was more or less impossible. I think she was a saint. Neither was a good parent, however, and their son Randolph was, by all accounts, even more impossible -- if there are degrees of impossibility. Randolph Churchill was once thought to have lung cancer, but a biopsy proved negative. About this event, Evelyn Waugh stated: "It is a miracle of modern medicine that it found the one part of Randolph Churchill that is not malignant and removed it." I'm not comparing myself to Winston or Randolph Churchill, or Evelyn Waugh. I am merely saying that I too suffer bouts from time to time with the black dog, and I have found that a certain remedy is to head to the open road, preferably in the desert Southwest, and look for trains. 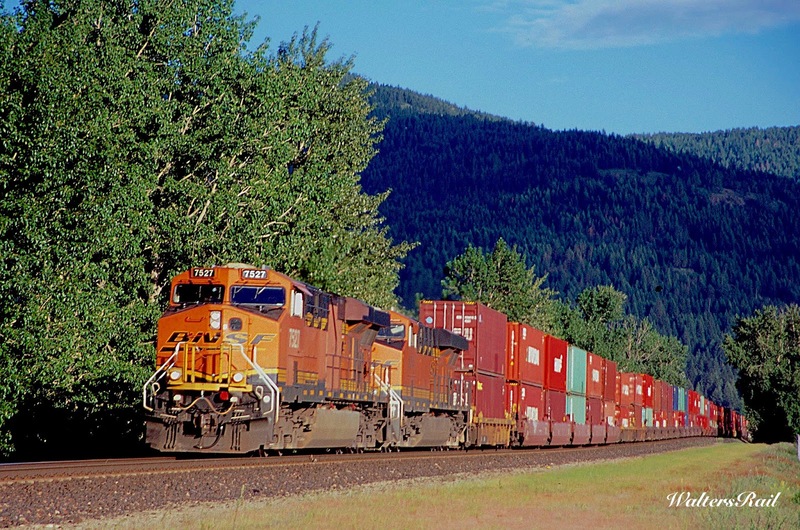 I love a clear blue western sky, with BNSF containers rolling across a wide, treeless valley, bracketed by sandstone cliffs as red as sunset. I love to sit alone with Bear the Mighty Dog and listen to the wind and the sound of an approaching train that can be seen for miles across the vastness. 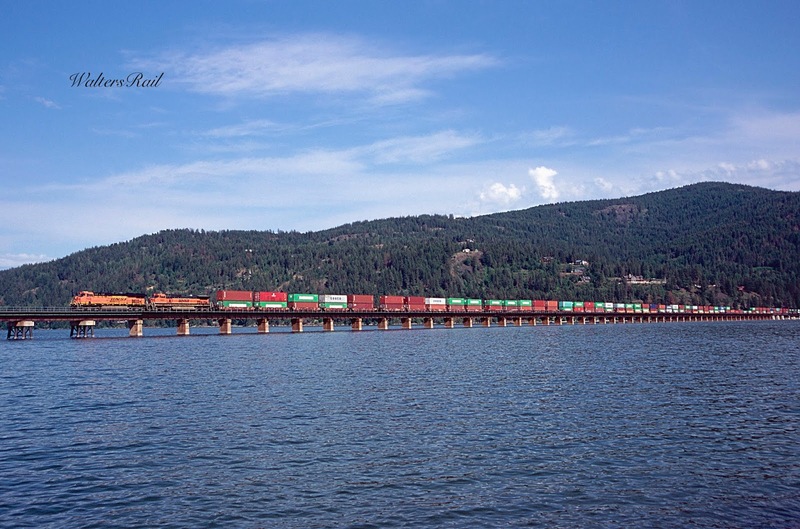 Westbound stacks cross blue Lake Pend Oreille. 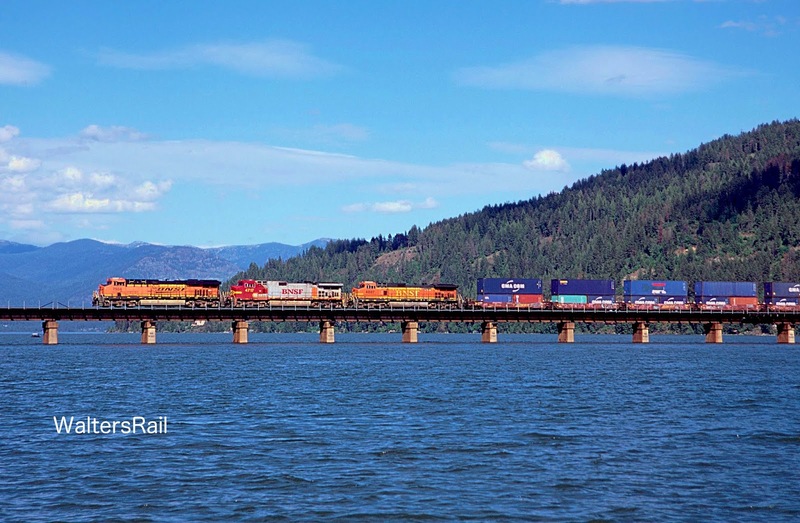 Eastbound stacks (compass northwest) are approaching Sandpoint, Idaho. I understand that many people are not enraptured by trains. 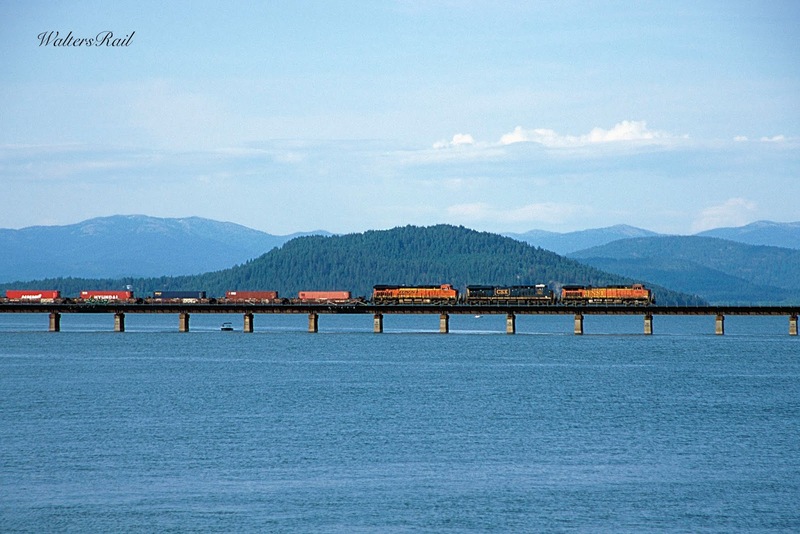 For example, in researching this article, I came across a web site in which the author excoriated the railroad bridge that crosses Lake Pend Oreille and included a photograph to demonstrate how close BNSF tracks pass to some of the restaurants in downtown Sandpoint, stating: "This is how close the trains run -- very scary and highly disturbing." The author was concerned that someday a train might derail, spilling oil or other toxic chemicals into the lake and/or over downtown Sandpoint streets. 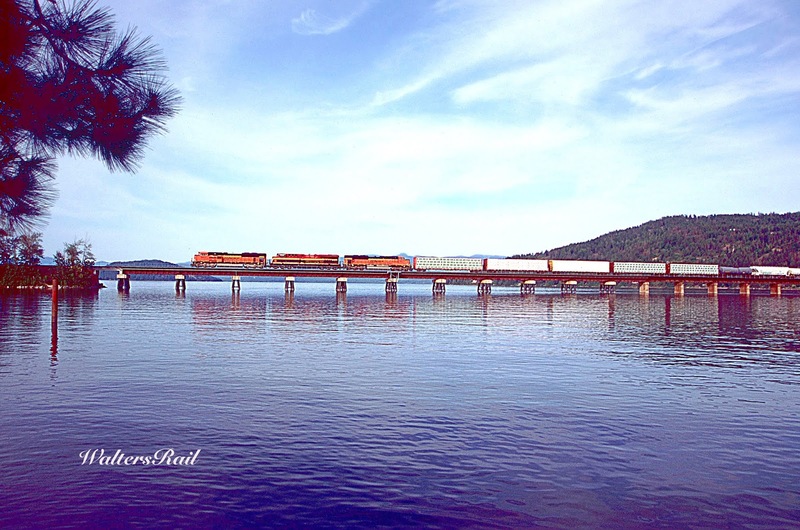 The following link will take you to the web site and photograph: http://www.lynnebuchanan.com/blog/2016/9/29/lake-pend-oreillepristine-beauty-at-the-heart-of-coal-and-oil-train-traffic. The web site contains many beautiful photographs and eloquently discusses the author's concerns for preserving wetlands across the United States and around the world. I share her concerns, and it is not my intent to criticize what she has written. Rather, I mean simply to point out how differently people can react to the same thing. I have eaten at the same restaurant where the photograph was taken. Where the photographer was scared and disturbed, I was thrilled to eat a good meal and watch trains roll through the funnel. I drank a beer or two and felt as happy as I am capable of feeling. This is why I believe that life is like an object viewed below the surface of water. The angle of incidence determines what one sees -- or does not see. Thus, one man's heaven is one woman's hell, because we are viewing the same thing from different angles. That does not mean that one view is correct and one incorrect. Both are accurate images of the reality in which we live. I understand the physics behind the angle of incidence, but I do not understand and cannot explain why that which brings me pleasure brings another pain. Only poetry comes close, and the best is Milton's: "They also serve who only stand and wait." So what did I see stirring in the depths of tranquil blue Lake Pend Oreille? I believe I caught a glimpse of the black dog that chases us all. We live our lives in the hope that it never quite catches us, but it is always out there somewhere, and it always does eventually catch up. If we can find a moment's respite, we should seize it -- whatever the angle of incidence. Wrought iron fences could prove one of the most powerful and maximum durable fence sorts if properly taken stored. Chemistry teaches that whilst you integrate water and Oxygen to iron you’d count on oxidation to occur on iron which means the iron rusts and will weaken its country reference.